For two sworn enemies, anything can happen during the Hawaiian trip of a lifetime. Discover a witty and swoonworthy romance from the New York Times bestselling duo behind Josh and Hazel's Guide to Not Dating and Roomies. Olive is always unlucky: in her career, in love, in . . . well, everything. Her identical twin sister Amy, on the other hand, is probably the luckiest person in the world. Her meet-cute with her fiance is something out of a romantic comedy (ugh) and she's managed to finance her entire wedding by winning a series of online contests (double ugh). Worst of all, she's forcing Olive to spend the day with her sworn enemy, Ethan, who just happens to be the best man. Olive just has to get through twenty-four hours of wedding hell before she can return to her comfortable, unlucky life. But when the entire wedding party - except for Olive and Ethan - gets food poisoning, there's an all-expenses-paid honeymoon in Hawaii up for grabs. Putting their mutual hatred aside for the sake of a free vacation, Olive and Ethan head for paradise, determined to avoid each other at all costs. But when Olive runs into her future boss, the little white lie she tells him becomes a whole lot bigger. She and Ethan now have to pretend to be loving newlyweds. But the weird thing is that she doesn't mind playing pretend. In fact, she feels kind of . . . lucky. 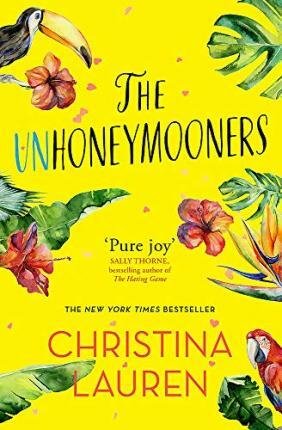 The Unhoneymooners is a heartwarming and hilarious romance perfect for anyone who has ever felt unlucky in love. Christina Lauren is the combined pen name of longtime writing partners/besties/soulmates and brain-twins Christina Hobbs and Lauren Billings, the New York Times, USA TODAY, and #1 international bestselling authors of the Beautiful and Wild Seasons series, Sublime, The House, and Autoboyography. You can find them online at ChristinaLaurenBooks.com, Facebook.com/ChristinaLaurenBooks, or @ChristinaLauren on Twitter.